Earlier this month the American actor Ernest Borgnine died at the grand age of 95. Borgnine appeared in a great many films in a career that spanned more than six decades; the ones I particularly remember are From Here to Eternity (1953) where he got his first big break playing the part of the sadistic Sergeant ‘Fatso’ Judson who you remember beats up a stockade prisioner called Angelo Maggio played by Frank Sinatra, Vera Cruz (1954) where roles like Donnegan helped him build a reputation as a dependable character actor. Then there’s The Dirty Dozen (1967) where he played Mayor General Worden along side Lee Marvin and Charles Bronson. My personnel favourite Borgnine movie was as Dutch Engstrom in Sam Peckinpah’s classic 1969 western The Wild Bunch, a story involving a group of aging outlaws trying to cope with the changing times of 1913. The question arose of which film should I watch to mark his passing? 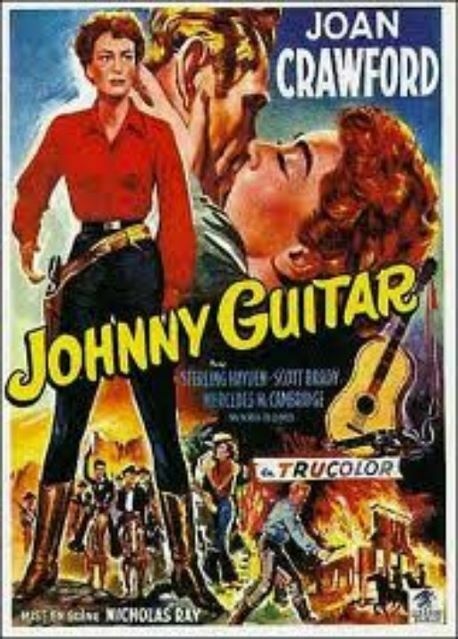 Johnny Guitar (1954) was directed by Nicholas Ray an American with a good pedigree that included the classic film noir In a Lonely Place (1950) and Rebel Without a Cause (1955) the penultimate James Dean film. 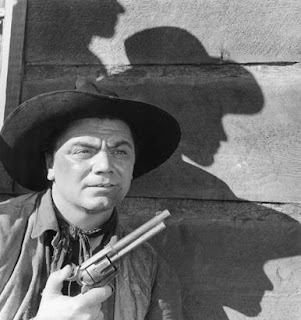 Borgnine was cast as the gun happy Bart Lonergan who was a member of the Dancin’ Kids gang, admittedly not a particularly large part but an important one intended to push the narrative. 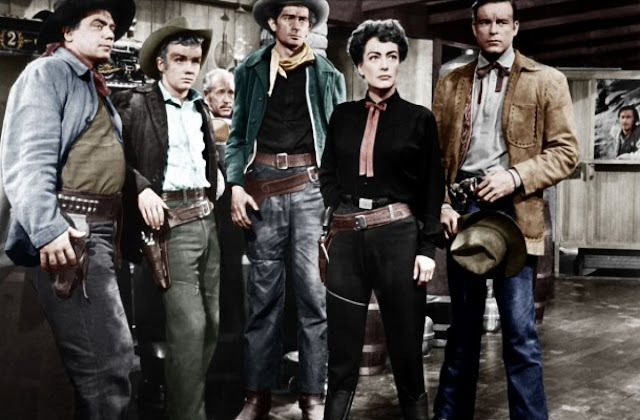 This melodramatic drama is a somewhat unusual example of the western genre. 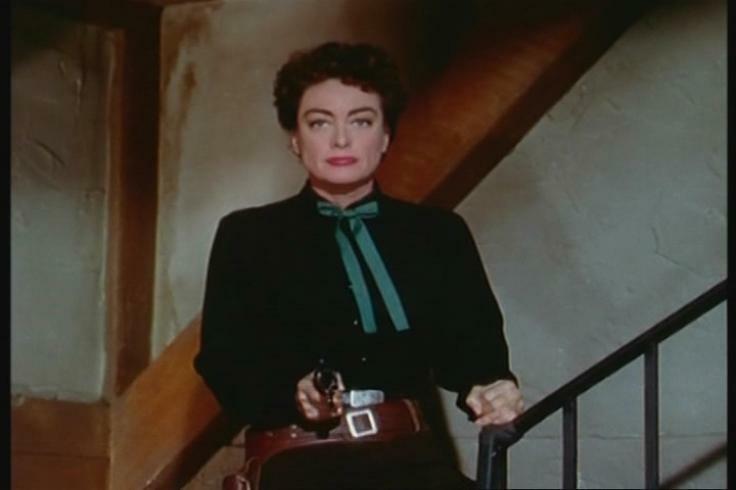 This is mainly because of the roles given to the two women in the film Joan Crawford and Mercedes McCambridge. Crawford plays Vienna a hard bitten women who is not adverse to wearing and using a gun, she is the owner of a saloon bar that stands completely on its own, well outside the local towns boundary, on land that is valued by the incoming railroad. McCambridge is the enigmatic gun slinging rancher Emma Small who has an on going vendetta with Vienna said to be over their rivalry for the affections of the Dancin’ Kid (Scott Brady) although if you value American critic Roger Ebert’s opinion its more to do with Emma’s sexual attraction to Vienna that fuels their rivalry to such extremes that Emma would rather kill her than admit to her feelings. 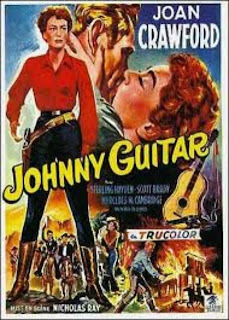 But it’s this gender reversal and the build up of sexual tension that not only includes the two women and the Kid but Vienna’s past relationship with Johnny Guitar (Stirling Hayden), who is summoned to play this instrument in her empty saloon bar. Claimed as a feminist movie by some and an anti-McCarthy allegory against mob hysteria and for these that make a stand on principal by others. 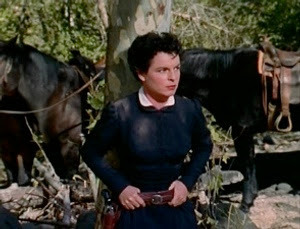 All I can say is that for a western fan its something completely different, accentuated by a great performances from the female leads, whom it is alleged hated one another off set as well as on, the slow pacing and its wonderful cinematic colouring. Martin Scorsese, in his introduction, describes the film as one of cinemas greatest operatic works pitched from beginning to end in a tone that is convulsive and passionate, performing far better in Europe than it did in its own country. Also it’s worth mentioning that it has a theme song sung by the magnificent Peggy Lee! Vienna with Dancin' Kid and his boys.